The DR 65 inox is a space-saving, front-opened drawer. Its new design is based on the standard 65 liters refrigerator though with apullout drawer featuring an innovative interior concept with bins and bottle racks. A sequence of 5 LED lights provides blue internal light. 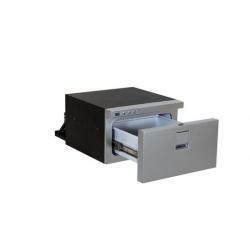 The smallest and lightest drawer unit available on the market, unique with its user-friendly digital interface. It is provided with stainless steel rails and door, painted in silver colour. The outer feeling is the highly appreciated Elegance design, provided with the typical product line&rsquo;s features as the easy fix installation solution. Equipped with a state of the art BD 1.4F Secop compressor, it requires minimum installation space. 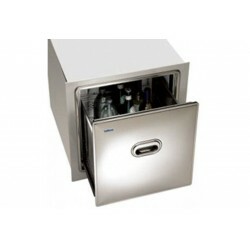 The Isotherm Cruise 36 Stainless Steel (INOX) is a built-in drawer fridge in unique design. 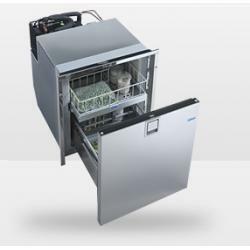 Due to its compact dimensions, the CR36 Stainless Steel can be installed where no other fridge might fit and has the capacity to hold up to a case of canned drinks. The compressor can be remotely mounted to 3.9&nbsp; feet away. The INOX (Stainless Steel) model comes with a four side flush mounting frame and 316 grade&nbsp;brushed stainless steel door that is not only handsome and nautical but rugged enough to stand up to the rigors of the marine environment. With a cutout height of 10 inches and remote mount compressor, the Cruise 36 is perfect for the flybridge, center console, aft deck, under a seat or setee, and in a stateroom for easy access to refrigerated snacks and beverages. Because of the full width internal drawer, the CR36 can hold a case of 12 ounce canned drinks, tall bottles, and more. 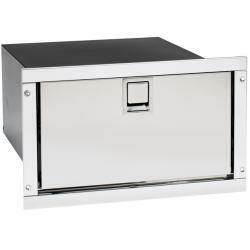 The DR 49 INOX is a new, space-saving, drawer unit with stainless steel front door. 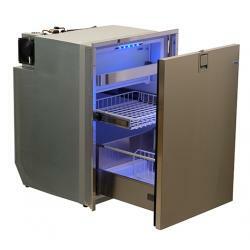 The interior is designed to suit international cans and food packs with two robust drawers, conventional international sizes of integrated adjustable bars, freezer compartment and internal blue LED light. 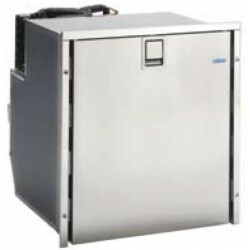 The DR 55 freezer is a 55 liters capacity stainless steel front opened drawer freezer. This model combines innovative stainless steel design with the most modern technology such as automatic defrost which allows having home comfort on board. The DR 55 F is equipped with an internal fan for temperature constant control and a sequence of 5 LED lights for blue internal light. 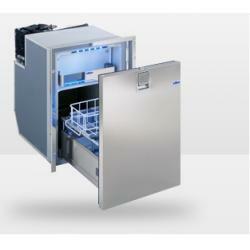 The DR 130 INOX is a drawer refrigerator in stainless steel design providing a gross internal volume of 130L. The main drawer-door mechanism is the top quality Isotherm solution, capable to ensure safe and large storage for food and drinks. A bottle rack and a patented modular shelves disposal are provided on the main counter door. Two inner drawers are available to ensure the maximum usability as well as great storage, with the top one as freezer compartment (-6&deg;C).